Projections from the Chilean Ministry of Mines predict a 230 percent rise in the amount of seawater to be used by the nation's copper mining industry in the next 10 years. A recent report from the Comision Chilena del Cobre predicts that the copper mining industry will increase it's use of seawater by 230% by 2029, compared to an increase of only 12% in the use of other water resources. The figures are based on both a significant increase in copper production, and an expected increase in the use of sulphide ores which require a more water-intensive process. 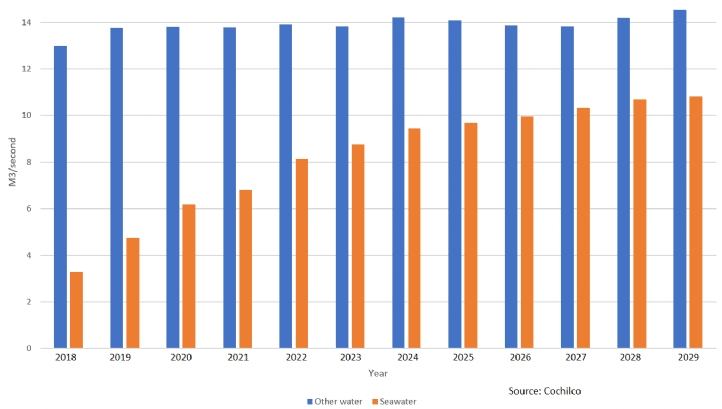 The increased seawater use takes into account existing plans for additional seawater pumping projects and plans to construct new seawater desalination plants. The report says that the majority of new mining projects and extensions to existing projects plan to use seawater either directly or with desalination. While the mining industry consumes only 3% of the nation's water, it is generally located in the arid areas of the country, and therefor its impact on water resources is magnified. The Ministry says the report is intended to help mining companies plan their resources use, and to inform the water industry of projected increases in demand.